All program recordings are stored in the “Recordings Gallery”, categorized into video, audio and photo sections. The software’s video snapshot feature proved futile, with 1080i channels reduced to 960x270 resolution and 720p channels reduced to 640x180 resolution. Analog channels captured at a more respectable 640x480 resolution, but occasionally had odd white speckles in black areas. For high definition channels the HD Pro is always working with the native, unadulterated transport stream, direct from the source. So overall video quality is going to be almost completely dependant on your video card’s processing capabilities. On my laptop with a 1280x800 screen, I noticed that 720p channels had rather obvious jaggies, while 1080i channels looked smoother and sharper but occasionally had visible de-interlacing artifacts. TV Center Pro applies some overscan to the picture that can’t be disabled, so 720p ended up being scaled needlessly on a monitor capable of the native resolution. Wanting to see what everything looked like on a full 1920x1200 screen, I transferred a few of the [rather large] recorded files to my desktop... and HDTV’s full glory was revealed! Viewing the recordings in Windows Media Player resulted in incredible detail, vibrant colors and no visible defects, whether the original source was 720p or 1080i. Audio was also reproduced in full 5.1-channel Dolby Digital (digital coaxial output is supported by TVCenter Pro). Operating as a conduit between an antenna and a computer for ATSC transport streams, the PCTV HD Pro does its job with aplomb. Pair it with a high-grade video card and you’ll have the highest quality HDTV possible! As a side note, the coaxial connector on the HD Pro gets surprisingly hot during operation, using the cable as a heatsink. The unit itself gets warm to the touch, but not unreasonably hot. A little insert in the package claims that this behavior is normal, but to “avoid direct contact with the connector”. Apparently, early versions of TVCenter Pro came with a fully integrated, automatically updating television program guide. The latest software version, however, has gone with a less sophisticated two-pronged approach. The first prong is an integrated PSIP-based guide. Put simply, “PSIP” is raw data transmitted by the stations themselves. Part of the protocol allows for a schedule of current and upcoming programs, but this information can only be received by first tuning that station. It takes a few seconds for the data stream to be processed, and as soon as the current program’s name comes up on-screen a few hours worth of shows for that single channel will be added to the EPG. 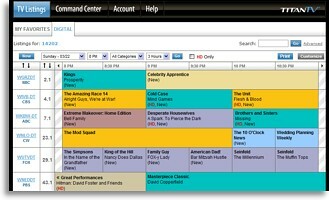 As you surf through other channels, their programs will be automatically added to the list. Show descriptions are rarely provided by the stations, and with only a few hours coverage there’s no way to find out what’s showing tomorrow. For that Pinnacle has the second prong: TitanTV. 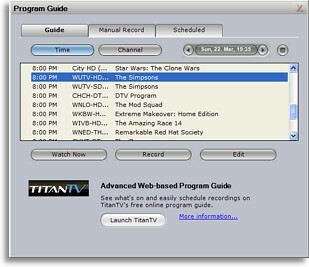 Available only through a web browser interface, TitanTV has the capability of integrating their website with TVCenter Pro to schedule recordings and upcoming show reminders. As it only covers US channels, the guide was of minimal use for my location. Regardless, it lacks any of the features that one would expect from a fully integrated guide, such as a video preview window, on-screen program names, a cursor navigable channel grid, extended descriptions that don’t require a separate pop-up window... I would say it’s what one might expect for free, except that the older (and still free) TV Guide utilities were far more versatile, especially if one is trying to surf the guide by remote control (which is essentially impossible here).